Cushionworx must use Shaw 3800 adhesive installed with a roller to attach the pad to the floor. 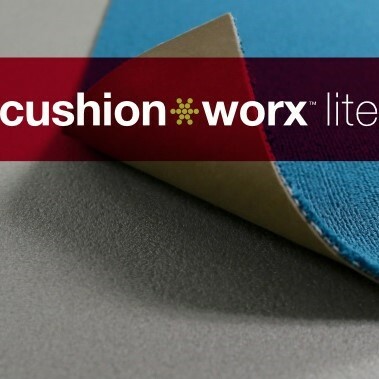 CushionWorx, a premium polyethylene foam cushion underlayment, performs with EcoWorx® carpet tile for comfort underfoot and sound reduction in hospitality applications. Users may not see CushionWorx, but they will experience a difference immediately. * Delivers underfoot comfort with 2 mm thickness and reduces sound transfer when installed with EcoWorx carpet tile in guest room spaces. * Provides more noticeable underfoot comfort than with EcoWorx carpet tile alone. * Adheres to concrete and wood subfloors with Shaw 3800 adhesive. Provide added stability by using Shaw 5100 adhesive to adhere EcoWorx carpet tile to CushionWorx Lite.